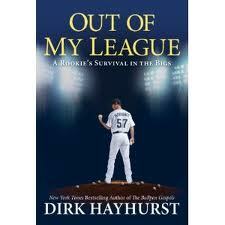 I finished a few days ago reading Out of My League by former MLB pitcher Dirk Hayhurst and thought it pretty compelling. 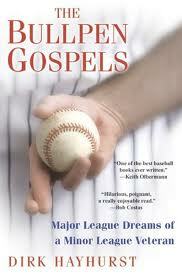 The book follows up on The Bullpen Gospels from Hayhurst (which I reviewed here) and chronicles the author's following season experiences. 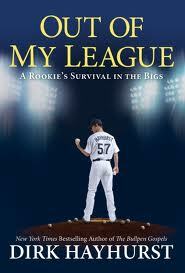 Just as the first book was about more than playing baseball, Out of My League is best when covering Hayhurst's life in relation to his parents and fiancee as well as his transition to the Big Leagues. Hayhurst details MLB as a challenging place socially where each rookie (while highly paid) is expected to: be deferential to veterans, show that they belong, not act entitled and follow a host of other "unwritten rules" that they're not supposed to ask about, but rather "figure out with experience." Perhaps it was a function of the team playing out a losing season (and might have been exacerbated by Hayhurst not being drafted highly), but the environment described seemed to not really gear towards succeeding. The point is made in the book that playing well can change everything, but it did seem a pretty lousy situation for someone to be called up into and then try to find footing both on and off the field. This writing about struggling in the Major Leagues was made all the more profound with Hayhurst describing the transition in relation to people outside the game. The story was told of him giving up a long bomb to Manny Ramirez and his mom viewing it as something exciting because he got on SportsCenter (while in crushing defeat). Additionally, acquaintances would either want something from him (tickets, signed baseballs, etc) or to simply be part of the discussion of how great it must be in the Big Leagues. There's also a compelling story of Hayhurst unloading on his fiancee (now wife) after a rough game... and her reaction in pointing out how the author was letting this realization of a lifelong dream change him for the worse. On the whole topic of baseball-related writing, I found surprising that the recent April 2 issue of Sports Illustrated had both a (very good) story by L. Jon Wertheim on book-writing Mets pitcher R.A. Dickey and a small piece on recent baseball books, but no mention of Hayhurst's book. It really was very solid writing from him that details how there's much more going with baseball players than we as fans see on the field. Now that I've actually finished writing and publishing the thing, it seems high time to note the process I went through with the book. Writing a book has for quite a while has been of interest, but more in the "gee, wouldn't that be great to some day write a book about, I don't know... something" type of way. In October of last year, though, I came across a blog post from Brandon Sneed titled "Why You Should Write A Book" which got me thinking more of the idea and then what really triggered action on the book was reading in December the James Altucher book I Was Blind But Now I See. There were a number of things that struck me from Altucher's book and in relation to my actually writing one, I noted his mention of having self-published using CreateSpace from Amazon. Related to this, I found interesting that that book didn't seem to have been closely edited (grammatical errors and odd layouts in places), but this didn't take away from a lot of interesting ideas and content from Altucher. Really, it was kind of inspiring to think of just getting words on the page and not letting a need for perfection stop or prevent the book process from beginning. I began listing out ideas for the book by mid-January and then was further inspired to write the book after reading two pieces that trumpeted self-publishing. Also linked to in this blog post, they were Chris Dessi comes of age by Jeff Pearlman and Self-Publishing Your Own Book is the New Business Card from Altucher yet again. Back to my own process of book writing... my initial idea had the book as a sort of autobiographical rambling around my writing background that would also include significant work from my blog. As I began working with the blog content (copied over into Word via Paste Special with formatted text) I realized that I was doing more of a book compilation project using writing already done rather than something completely new... and was totally fine with that. While getting further into the cleanup (for grammar, layout and to remove content no longer interesting to me) of 150,000 or so words, I fairly easily decided on the book sections and then part of the editing process was including each relevant post into that given section. As this editing continued, I assumed/hoped that the CreateSpace process would go fairly smoothly once I was ready to submit early March... and was happy to find that it did. Steps involved taking my Word document, saving it as a PDF file and then uploading it, picking a cover design from the CreateSpace library and then waiting a day or two for CreateSpace to complete the acceptance and (cursory, I'm sure) review process so that I could order a proof. I received the paperback proof copy less than a week later and in reviewing it saw that I had basically the finished product book I wanted, but still a few modifications were needed. This mean going back to the original Word document and changing a few words, moving a few sections and going through what I found to be the cumbersome process of adding to each page a header that varied by section. I eventually was able to get the Word doc as desired and then save as a PDF for resubmission to CreateSpace, but it required quite a bit of looking online and then following steps in an exact fashion to get the section headings and page numbers as I wanted them. Once the new PDF was submitted to CreateSpace and second proof ordered, I worked on figuring out how to have a PDF download available from the blog. I found mention of both Google Docs and Scribd for the purpose, but it seemed to me the interface just nicer via Scribd... which also included the ability to actually embed the book into a blog post. So, all this said... I took 3 1/2 years of blog posts, cleaned them up, cut out the ones of less interest now, organized the posts into sections, added introductory text and wound up with a book. Pretty happy with both the end result and that the process took only around two months. Not too bad. Yep, I wrote a book. It can be found via both the Amazon & Scribd links below... with Scribd providing the ability to download a PDF version containing all the links referenced in the book (yea, I know the huge royalties don't come to me if the book simply downloaded). Intent of writing the book was to take much of the blog content I've written over the past few years, compile and edit it down a touch, group it into the categories noted below and... call it it a book (many more details on my blog post Words Written Down Book Process) and myself an author (with "self-published" in tiny little font). Words Written Down is a compilation book project that came out of the blog www.wordswrittendown.com and an appreciation of words put down on a page in a meaningful order. The blog itself was begun some 3 ½ years ago and contains the following top of page description: Blog is all about words because... they matter, they influence, they entertain and when you take 'em and put them down on a page in a meaningful order, they acquire permanence. Contained here are a bunch of written words in the form of book reviews, magazine and web article links & summaries and other stuff I like to write about. Links noted throughout the book can be found at the referenced blog post and criterion for inclusion of each revolves around the concept of Interesting. If writing was deemed interesting, it‘s noted along with my ruminations on the topic and view of what makes that particular set of words grouped together into a book or story be so good that they acquire permanence. The goal of Words Written Down is to highlight and pay homage to this permanence of words. Why? Cause I like words. 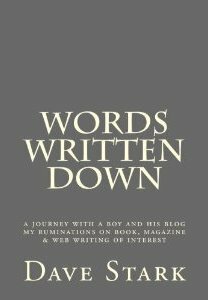 - Writing – includes content from others on writing, my ruminations on it and a soliloquy post on the topic of Social Media. - Work – posts on both links to career related content and my writing around work. - Sports – lots of extremely entertaining content linked to and written about in this category… love me some great sports writing. Also, it’s a bit of an obvious statement but excellent sports writing is about more than just sports. Pieces referenced came from Sports Illustrated more than any other source. - Business – includes companies, profiles and lots of other business related content written on and linked to. Some of the specific areas of business covered (and noted in the blog tag cloud) include customer service, social media and cloud computing. Content referenced as interesting came from a variety of sources, with Businessweek and Fast Company fairly heavily represented. - Everything else – perhaps could have been named better, but really is… everything else (life, current events, history, politics, money, profiles, etc) in terms of non-book content written on and linked to. A fair amount of the content noted came from both writing in and writers for Time or Esquire. - Book reviews – Not all the books were great, but definitely quite a few excellent ones I’ve read and posted reviews on here. I've come across a number of pieces over the last few weeks with each interesting and all involving career changes. Longest of the pieces was "How One Response to a Reddit Query Became a Big-Budget Flick" for Wired by Jason Fagone. I first heard of Fagone from an excellent Esquire profile on iconoclastic video-game programmer Jason Rohrer and he tells in the Wired piece quite a career change tale. Reddit is website community where people can link to or post original content they find interesting and Fagone details how Reddit resulted in Des Moines, IA based James Erwin going from being a technical writer to signed by Warner Brothers studio screenwriter. It's a somewhat amazing path, but which actually makes sense after reading some of Erwin's content reprinted in the Wired piece. The trigger for his writing came from a Reddit discussion thread about modern day armed forces battling in ancient Rome to which Erwin posted fictional vignettes about a US Marine Expeditionary Unit dropped into that setting. It was compelling writing which then (a) acquired a subreddit heading of RomeSweetRome, (b) was found by a Hollywood talent agent and (c) led to the Warner Brothers deal to write a full screenplay and Erwin's leave of absence from his technical writing gig. It was a well written piece by Fagone that details a very cool tale of a guy who did some extremely creative work. Related to the same writing career change subject (though, not as large a change as Erwin's), I enjoyed quite a bit the commentary "Kevin Van Valkenburg: A fond farewell to The Sun and its readers." It was written upon Van Valkenburg's leaving (of his own volition) the Baltimore Sun to write for ESPN and has some profound content on writing, working and taking chances. Finally, it doesn't have the same writing career element, but another piece of note lately very much had the same career change theme... and follows up on a story seen previously. In September 2010, I did the (long-titled) post "Ex-CEO as Nebraska Volunteer Coach / Not too Late for Career Changes" that linked to a story on Joe Moglia. I hadn't heard anything new on the former Ameritrade executive who wanted to be a college football coach until seeing the piece "Former CEO taking over at Coastal Carolina." Written by Reid Forgrave for the site Fox Sports Carolinas, the piece details Moglia's background and move from the Cornhuskers to head of a United Football League team and now... head coach for football at Coastal Carolina University. One could take the cynical view and say that Moglia's money helped him get the gig, but it seems more accurate to say his money helped him have the time to work really hard to reach this career goal. Would certainly have been easy to just be content with what he'd accomplished previously, but it was cool reading about Moglia going after something he wanted to do. There was an interesting piece published earlier this month in a North Dakota newspaper earlier this month that had an absolutely fascinating reaction to it... with that reaction yielding some other interesting writing. The piece itself was "Long-awaited Olive Garden Receives Warm Welcome" and the restaurant review from 85 year-old Grand Forks Herald columnist Marilyn Hagerty went viral on the Internet due to its earnest and seemingly small town take on the new Olive Garden. The review was humorous for this reason, but what really struck me was this concept of earnest and what a few other writers had to say about it in relation to Hagerty. Two pieces that came from writers I follow were "In Web world, can we be sincere and cool, too?" by Tommy Tomlinson for the Charlotte Observer and "The Olive Garden" on the personal log of Joe Posnanski. The pieces were each written out of an Olive Garden meal the two friends shared and both expressed well an admiration for writing by Hagerty that was plain-spoken, but more to the point... devoid of sarcasm, biting irony or other vehicles of excessive critique. Posnanski's blog post was the longer of the two pieces and included a great vignette about him spending time with his daughters at Disney World and how it is that age tends to bring out the cynical in people. Really cool content that reminded me of a different Joe Posnanski blog post "Katie The Prefect" on an experience his daughter had at Harry Potter World and how great it is to still be young and excited by things. A third recent and related piece was from her son, James Hagerty, a Wall Street Journal writer. "When Mom Goes Viral" provided more detail around someone writing what they felt and having that authenticity be the driver of their work. While on the path of "writing this story brought to mind", I also thought of an excellent interview with Dave Eggers where the author wrote about the import of doing things of interest without getting caught up in worrying about how outsiders will react to or judge your efforts. 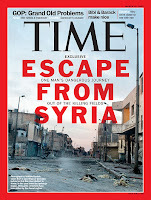 There were a few excellent pieces of writing from the past couple issues of Time Magazine, starting with the most recent Mar 19 edition. 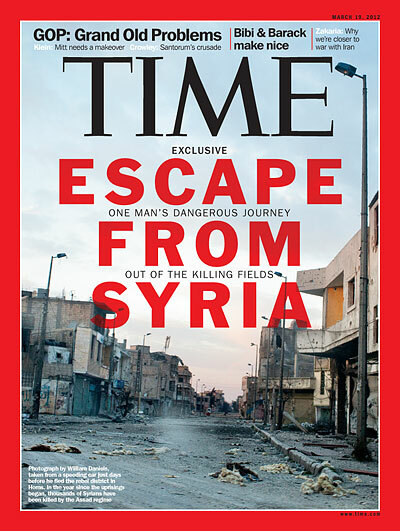 Cover story was "Escape from Syria" by Vivienne Walt and tells the story of journalists being targeted for death by and attempting to escape the Syrian Armed Forces of President Bashar al-Assad. It's extremely harrowing content taken from journalists William Daniels and Edith Bouvier who were able to get out of the country (with Bouvier badly injured) after surviving the rocket attack that killed journalist colleagues Marie Colvin and Remi Ochlik. Extremely important writing in this piece that's prefaced in the beginning of the issue by "The Need to Bear Witness in Syria" from Time Managing Editor Richard Stengel. Two additional Time pieces of import were from the Mar 12 edition and dealt with the subject of climate change and efforts to mitigate our impact on the environment. Both pieces by Bryan Walsh, "Cold Warrior" profiled environmental writer Bill McKibben and "Nature Is Over" overviewed (as part of the issue's "Ten Ideas Changing Your Life" section) changes to the earth and environment in what's now being termed the Anthropocene epoch: the age of man. There were two Sports Illustrated features from the past few weeks that stood out for their impact. From the Feb 27 issue was "The Way We Play The Game" around the paralyzing injury suffered by Minnesota high school hockey player Jack Jablonski. The story was written by Karen Schneider, the mom of a fellow player, and is a profound tale that's also solid writing. I've previously noted writing on high school football injuries with this post including a Patrick Hruby written piece and this post a story by San Jose Mercury News writer Mark Purdy and (while I feel it much safer than football), hockey a sport with the potential for life altering injuries. From the Mar 12 issue of SI David Epstein and L. Jon Wertheim wrote "Distance Runner Rhiannon Hull was always eager to push the limits of her endurance, then the pacific ocean put her to the ultimate test." The piece fairly early on includes the sentence "Rhiannon Hull was in the homestretch of the most important race she would ever win. And lose." Probably quite a few different emotions that could be evoked from reading the story, but the overriding thing is it's powerful writing on love, life and death. There was a bevy of interesting content out of two recent Businessweek issues... the Feb 13 and Feb 27 editions. From the further back Feb 13 issue with Vladimir Putin on the cover came an interesting feature story as well as shorter vignette of note. The feature was written by Stefan Faris and titled "Grounds Zero: A Starbucks-Free Italy" on the Seattle-based retailer not currently having any locations in the country that inspired its offering. I imagine Starbucks head Howard Schultz has his reasons to not be there (and may well have plans and timelines to enter the market), but it's pretty remarkable from a symbolic perspective that it hasn't happened yet. From this same issue came the fairly short piece "A Solution to the Housing Crisis Could Be at Hand" that details the government Home Affordable Refinance Program (HARP 2.0) aimed at helping people current on their payments, but still underwater refinance. The Feb 27 issue was similar to that from the 13th in that it had a feature story of note along with smaller piece of interest (in this case, two pieces). Cover article was "Mitt Romney's Box of Kryptonite" by Paul Barrett and the piece stood out not really as being a hatchet job on Romney, but rather one than that seems to point out Romney taking credit for something not warranted. As I wrote about in a June 2010 blog post, companies are primarily designed to be profit-making enterprises (with publicly traded ones by law having mandates around trying to increase shareholder value) so Romney's time pursuing profits as the CEO of private equity firm Bain Capital shouldn't be a black mark on him. However, Romney's attempts to paint himself as a job creator from that time should be examined as there's examples like from the Barrett piece where increased profit often came at the expense of worker's jobs. Romney as a candidate can't have it both ways... to have done well at Bain is well and good, but to run on a platform of job creation while stating no involvement in job loss comes across as a bit selective. From this same Feb 27 issue was also two smaller pieces of note: "Stripe Aims to Reinvent E-Payments" is on the competing with PayPal (and Square) credit card processing company and "Hybrids' Unlikely Rival: Plain Old Cars" details the fuel efficiency improvements seen in the standard internal combustion engines for many new cars. Recently finished reading The Bullpen Gospels by Dirk Hayhurst and found it to be an entertaining read from the former minor (and briefly major) league relief pitcher. I heard about the book from a New York Times piece by Tyler Kepner titled "Far From a Storybook Ending, a So-So Pitcher Turns the Page" and felt that the book content could be divided into (A) that on the hijinks in and around a minor league clubhouse and (B) that on Hayhurst's life with both his family and around the experiences that mean something to him. The stuff around baseball itself was somewhat interesting and entertaining to me, but really just solidified something I had already thought was the case... it's a hard road being a minor league athlete. Unless it came as a signing bonus, you're not making much money, but have tremendous pressure on you... both to succeed and advance to "become a real major league player" and to fulfill fan expectations of you (love how minor league players get in trouble for giving away baseballs). The interesting part of the book to me came from the content about Hayhurst's family with the alcoholic brother, father who suffered a debilitating injury and mother who was just tired of iut all. This twisted background mixed into the story of Hayhurst's stories of extreme kindness with giving away his boots to a homeless guy and bringing the three year old cancer kid into the bullpen to demonstrate that the actual wins and losses in baseball just not that important. To this point, the intro quote to the book (which was later echoed in a conversation with allstar Padres closer Trevor Hoffman) seemed to encapsulate his view with the quote "for all the great things baseball is, there are some things it is absolutely not. And that is what this story is about." Overall, it was a nice read... and is followed up by the just recently released Out of My League from Hayhurst. This compilation post has been a while in coming (drat that cold), but there's been some excellent writing I've come across lately that falls under the shared umbrella of amazing stories (not the TV show kind). Oldest piece was "Burning Man" by Jay Kirk from the Feb issue issue of GQ Magazine. The story of US combat vet Sam Brown and his experience dealing with pain after suffering severe burns on much of his body. Its remarkable stuff that utilizes immersive Virtual Reality technology (in Brown's case a program called SnowWorld developed at the University of Washington) to distract users away from thinking about their pain. Also from GQ, but the March issue was "51 Dead in Ohio" by Chris Heath on the Zaneszille, OH release and subsequent hunting down of exotic animals. In an excellent example of journalistic striving, Esquire in its March issue had the Chris Jones story "Animals" about the same horrible events. Its understandable that what went down in Zanesville would draw such feature story interest so since they were both written - I may as well compare the two. I've certainly seen a lot more work by Jones than Heath and so I expected to like his Zanesville story more (and did), but I also liked some of the areas that Heath went to in his story that Jones decided to stay away from in the interest of focus. To that point, the piece by Jones deals almost 100% with that evening and in an almost clinical fashion takes the reader through the discovery of the animals being loose and then their being hunted by police. Jones talked about it in an interview with fellow Journalist Brandon Sneed, but he both wanted the piece to read like a police report and give the message, but not in a commentary form, that actions taken by the Sheriff and his men were absolutely necessary. It was an incredibly compelling read that led from one "what's next?" moment to another. Back to the GQ feature from Heath... his approach to the story differed in that he split it up into three parts- one on the events of the night (focus from Jones), one on people owning and keeping exotic animals and one on the man with the 50 exotic animals he let loose on his property prior to taking his own life. This third portion on Terry Thompson was tremendously interesting writing that gave a view into someone who would make such an incredibly reckless and selfish decision. Getting completely away from rampaging lions and tigers (no, not gonna complete that phrase), there were two other pieces to include here that dealt with people reminiscent of the Dos Equis Most Interesting Man in the World. From Mike Dash for the Smithsonian Magazine came The Mysterious Mr. Zedzed: The Wickedest Man in the World (yeah, same alliteration as the Dos Equis guy, but also quite a dude) on turn of the 20th Century arms merchant Basil Zaharoff. Many steps back on the wicked scale, but appearing just as remarkable as Zaharoff was the subject of a New York Times obit written by Margalit Fox. John Fairfax, Who Rowed Across Oceans, Dies at 74 includes the following "At 9, he settled a dispute with a pistol. At 13, he lit out for the Amazon jungle. At 20, he attempted suicide-by-jaguar. Afterward he was apprenticed to a pirate." I mean, enough said!